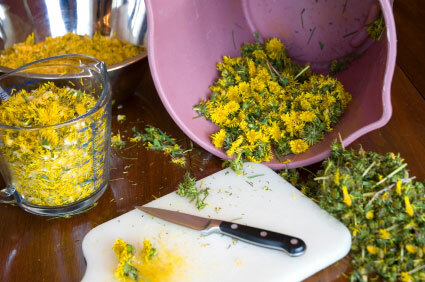 Dandelion wine does not require any special equipment to make. Just dandelions, some sugar and yeast, oranges and lemons, and pots to boil water in. This recipe uses cloves, which I think give it a nice touch. If you have dandelions around, give it a try! Wash the dandelion blossoms well. Put them in the water with the orange, lemon and lime juices. Add the cloves, ginger, orange and lemon peel, and sugar. Bring to a boil, reduce heat and continue to boil gently for one hour. Strain through filter paper (coffee filters work great). Cool. While still warm (but not hot), stir in the yeast. Let stand overnight and pour into bottles. Allow uncorked bottles to set in a darkened place for three weeks. Then cork and store bottles in a cool place. Note: Choose dandelions from an open field far from any insecticide spraying. Pick early in the season when the leaves of the plant are still tender. Flowers that have just opened are best for Dandelion wine.